For an impressive 37 years (1972 to 2009), Mathilde Neubauer worked for AKG, an Austrian company with a long tradition. As Head of Advertising she helped to develop one of the best-known Austrian brands and to make it even better known worldwide. In this effort, she focused primarily on strengthening the position of AKG products in the company's main markets, the USA, Europe, and Asia, year after year. Today, AKG products are among the leading professional and consumer audio lines in the world. Mathilde Neubauer retires on the 1st of August 2009. Having headed the Advertising Department for so many years, she admits with a modest smile that her heart will continue beating for AKG even in her retirement. "AKG is famous for making premium quality microphones and headphones, many of which have become legends. Mathilde Neubauer proves that many of the people behind our products have become legends, too. I would like to thank her personally for contributing to the development of the AKG brand for all these years," explains AKG Vice President, Marketing, Alfred Reinprecht. He will add Mathilde Neubauer's agenda to his own responsibilities effective August 2009. AKG is a unit of Harman International Industries, Incorporated (www.harman.com). Celebrating the 40th anniversary of arguably the most significant musical event in history, Warner Home Video has released “Woodstock: 40th Anniversary—Ultimate Collector’s Edition” on Blu-Ray disc. The release features a re-mastered director’s cut of the original film, including many previously unreleased performances. Legendary producer/engineer Eddie Kramer, who engineered the original recordings that captured the 1969 event, was called by Warner to mix this wealth of previously material. For the project, Kramer relied on a 5.1 JBL LSR6300 studio monitor system to bring the tracks to life in Capitol Records Studio C control room. Thanks to modern recording technology, Kramer has been able to restore and improve the quality of the recordings from those historic three days. “Interestingly, with the technology that is afforded us today, one can now repair things that were irreparable even 15 years ago,” Kramer said. “It’s great, because where a lot of things weren’t working in those first songs, we’ve salvaged a lot of great performances and literally raised tracks from the grave.” The project includes unreleased performances of Creedence Clearwater Revival, the Band, Santana, the Grateful Dead and other iconic acts. In addition to the detail, the neutral and even coverage of the LSR monitors has also proven advantageous for Kramer. “I love the LSR monitors because they’re so smooth and the top end doesn’t take my head off,” Kramer said. “I can sit in the studio all day long, for 12 or 14 hours, and my ears don’t fatigue. Two of rock’s most legendary British performers, Eric Clapton and Steve Winwood, recently reunited to tour North America. Premier rental firm Sound Image supplied JBL VERTEC® line arrays powered by Crown amplifiers to ensure adequate output power, fidelity and coverage for the high-profile project. Industry veteran and Clapton’s longtime live sound engineer Robert Collins handled mixing duties at front of house. A sell-out reunion date at New York’s Madison Square Garden last year paved the way for the 2009 “Two Legends, One Live Experience” tour, which spanned 14 cities in 20 days, beginning at the Izod Center in East Rutherford, New Jersey and culminating at the Hollywood Bowl in Los Angeles. The nightly set list included several songs from the classic 1969 album Blind Faith, which Clapton and Winwood recorded with bandmates Ginger Baker and Rick Grech. The live sound reinforcement system for the just-completed tour included a total of 84 VERTEC full size line array loudspeaker elements, configured in multiple array hangs to provide 270 degrees of audience coverage. The rig included 14 VT4889’s per side for the main hangs, 12 VT4889’s per side for outfill, with another eight per side for rear coverage in typical arena venues. An array of 16 VT4880 full-size arrayable subwoofers rounded out the system. A total of 72 Crown IT8000 amplifiers, networked for remote control and monitoring via Harman’s HiQnet™ System Architect™ software platform, powered the system. In preparation for one of the world’s most famous sporting events, systems integration firm Studio Berar outfitted 13 sports venues in Serbia with JBL loudspeakers and Crown amplifiers for the 2009 Summer Universiade games. The Universiade is an international event that hosts university athletes from around the world. This year’s Summer Universiade took place from July 1 to July 12 in Belgrade, Serbia. It hosted more than 9,000 athletes from over 140 countries, all of who competed in 15 different sports and 203 disciplines at more than 50 sport venues. This year’s games celebrated three anniversaries for what some consider to be the largest and most important sporting event next to the Olympic Games: the 25th Summer Universiade, the 50th anniversary of Universiade, and the 60th anniversary of the International University Sports Federation. For the largest sports venues, including soccer stadiums Marakana and Partizan, as well as the Belgrade Arena and the Belgrade Fair Hall, Studio Berar installed event systems that each contained 16 JBL VerTec VT4889 full-size line array elements, 12 JBL VerTec VT4888DP midsize powered line array elements with DrivePack® technology, 32 JBL VRX932LA and 16 JBL VRX918S subwoofers. With the exception of the VT4888DP elements, Crown CTs 3000 amplifiers powered all the systems. Additionally, Studio Berar supplied a total of 86 EON315 powered portable loudspeakers, which were deployed as needed to address audiences in numerous smaller soccer courts and basketball halls. 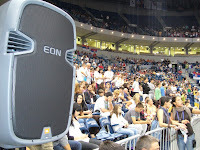 In summation, JBL was the exclusive loudspeaker for the entire Universiade games. "This prestigious event is a real challenge, and the JBL speakers are a great choice, considering their sound quality, portability, and reliability,’’ said Aleksandar Kruscic, Sales and Application Engineer for Studio Berar. The Norwegian parliament in Oslo is using a large number of BSS Audio Soundweb devices for different applications, covering meeting rooms, hearing rooms and the main parliament assembly auditorium. The plenary chamber recently saw a major upgrade to a Soundweb London system, relieving the older Soundweb Original system from its duties, which it has been performing since 2002. The new system, installed during the Easter recess by Norwegian BSS Audio distributor, LydRommet AS, includes four BLU-320 break-in / out devices in an 8 x 8 configuration, and eight BLU-160 devices, all configured with four analog inputs, four digital outputs and eight analog outputs. Two BLU-10 touch screen remotes control the system locally, and the package includes a BLU-80 device located in the offices of the technical department for surveillance and monitoring of the entire system. All 12 devices share the same control network and design file, but in terms of functionality there are two identical systems divided in separate Digital Audio Bus rings for full redundancy. The matched configuration of the devices also serves as an additional back-up, enabling devices to be swapped easily if required. The BLU-320 devices serve as microphone preamps and CobraNet™ interfaces, while all processing and distribution routing and management is taken care of by the BLU-160 devices. In addition to the sound reinforcement system in the auditorium there are more than 120 destinations including broadcast applications. The new system replaces eight Soundweb sw9088iis devices and four high quality eight-channel microphone preamps. While the old system was utilizing close to 100% in DSP processing power, the new system is idling at around 20%. In addition, the Soundweb London system introduces great improvement in signal-to-noise ratio, and the overall sound quality has been raised to a higher level. Adlib Audio sent out two Soundcraft Vi6 digital mixing consoles — and two excellent sound technicians to babysit the systems — when they took over the production of feature stages at this month’s Latitude Festival. In charge of the highly influential Uncut Arena was the experienced Walter Jaquiss, while simultaneously the same furious schedule, with back-to-back changeovers, was taking place in the Sunrise Arena, where Otto Kroymann was based. While bands were turning round within 15 minutes at the stage end, sound engineers were setting up their patches with equal alacrity at front of house — no doubt relieved that in each case a Soundcraft Vi6 digital mixing console awaited them alongside their two mentors. The Vi6 is quick to repatch and even quicker to jump onboard and start mixing for any sound engineer still to receive his induction. “Adlib were conscious of having to put out a desk that everyone could mix on easily,” stated Walter Jaquiss. He set up a regime in the Uncut Arena where all show files were created off-line. “For those (engineers) who arrived with no show file I would take the patch from stage and create the file on a laptop,” he said. A bonus for Walter Jaquiss has been the arrival of Soundcraft’s v3.0 software, and the ability to take the generic festival patch from an Excel spreadsheet (using .csv files) and copy and paste channel labels. “To be able to do this with all 40 channels and then export them to your USB key — having already had them in another spread sheet — is fantastic. This would normally take a lot of time and it helps if [engineers] can see a personalised layout. Over in Sunrise Otto Kroymann was undergoing a similar manic routine — but again, his knowledge of the Vi6 won the day. “Quite a few sound engineers were using the Vi6 for the first time but everyone said how absolutely brilliant the experience was. In view of the lack of time, many engineers used the board like an analogue surface with the digital features added on top. “This worked brilliantly,” he said. For Walter Jaquiss and Otto Kroymann there had hardly been time to draw breath over the three days — and both men were delighted that, thanks to the user-friendly features of the Vi6, they were able to get over the finishing line unscathed. The Soundcraft Vi4 has already shown its versatility and power for Camp Digital remote recording projects including the Gospel Music Association’s Dove Awards, Gospel Dream and the Country Music Association’s Fan Fest. What sets Camp Digital’s new Journey HD truck apart from other high-definition video/multichannel audio remote vehicles is its emphasis on sound quality and functionality. With a target client base of music and entertainment productions, audio is a high priority in the Nashville, Tennessee-based truck’s technology complement. And at the heart of that is the Soundcraft Vi4 digital live sound mixing console, the latest addition to Soundcraft’s highly successful Vi Series of digital live sound consoles. “There was a niche we saw developing in the entertainment market: the need for HD video coupled with high-resolution, multichannel audio recording in a single package at a price that was affordable,” explains Tom Gregory, Vice President of Business Development for Camp Digital. "A lot of companies are loading up their HD trucks so they can do any kind of work, and obviously you pay for that whether or not you use it -- when you're in one of those trucks you see a lot of equipment that’s not even turned on. The vast majority of the work we do is music and entertainment, so we wanted to build a truck that was more in the budget range of a flight pack and that would fill a gap in the marketplace between a $30,000-a-day 53-foot HD production truck and a flight pack." That’s precisely what they accomplished with the 36-foot Journey HD truck, which was commissioned last December. Its video technology menu is formidable, including Sony HDC1500L cameras, Fujinon lenses, Sony HVR1500a VTRs and an Echolab Overture 2MD multi-definition switcher. But its audio capabilities are just as impressive – the Soundcraft Vi4 digital audio console is coupled with a 64-track Pro Tools HD system and a Harris Panacea 8x8 digital AV router. “The Soundcraft Vi4 is the keystone to the Journey HD’s audio design,” Gregory explains. “It has a small footprint, which lets us put a lot of power into a smaller space.” In just under 1.5m/5 feet of length, that power includes access to 72 inputs on 24 faders, with a total of 35 output busses available for use as masters, groups, auxes or matrices. And the features of the larger Soundcraft Vi6, such as the highly acclaimed Vistonics™ II touch-screen user interface, Soundcraft FaderGlow™ fader function display and the unequalled audio quality, are all present on the Vi4. The Soundcraft Vi4 offers all the functionality and facilities of the Soundcraft Vi6, but in a smaller, more compact footprint more suited for space-conscious applications such as theatres, OB vehicles, Houses of Worship and venues or clubs with space-limited mix positions. For sound designer and FOH engineer Dag Stephen Solberg, a trip from one end of the musical spectrum to the other could be made in the company of one Soundcraft Vi6 digital audio mixing console. Well, more than one, if you count the additional desks being used for monitoring and submixing tasks. But it is the impressive sound quality of Soundcraft’s front of house console that made it first choice for Scandinavia’s largest outdoor pop concert, the VG-Lista Topp 20 in Oslo, as well as the epic outdoor production of ‘Turandot’ by Opera Ostfold, with nearly 450 performers. Solberg took charge of FOH mixing duties at both events, working with one of Norway’s leading concert services companies Frontlite AS to overcome some significant concert sound challenges. In Oslo, despite appalling weather, 90,000 people packed into the Radhusplassen for a free concert of the best pop music that Norway has to offer, including Eurovision winner Alexander Rybak, the country’s most popular live band BIG BANG, and the legendary A-Ha as headliners. Sponsored by the largest Norwegian newspaper, and broadcast live on NRK, the one-day event is staged in the centre of the city on a site bordered by the harbour as well as civic offices. Although the VG20 concert is well-supported by the local administration, Frontlite’s team can’t let rip! At FOH, Solberg is limited to 103dB (weighted). He describes his objective at the desk as “trying to make it sound fat so that you can feel the SPL without it tearing your head off!” His tools are a substantial and highly directive line array system, and a Soundcraft Vi6 handling 48 channels of digital audio. Solberg’s colleague Espen Andersen works the monitor mixes from another Vi6 stage-side, a partnership that was repeated for the Ostfold Opera’s season of ‘Turandot.’ Staged in an old fort in Halden, near the Swedish border an hour from Oslo, this year’s production featured 350 people on stage, in addition to an 80-piece orchestra. Once again serviced by Frontlite, one of the only companies in Norway capable of handling a production of this size, the FOH platform included a Soundcraft Vi6 delivering 96 inputs, and a Soundcraft Si3 as sub-mixer handling another 56 channels. Solberg mixed sub-groups of the orchestral string sections to the 96-input Vi6 monitor console. 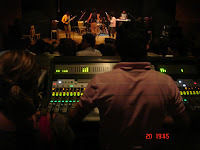 In what seems to be a never-ending string of musical events and cultural celebrations coming out of India these days, emerges another festival; the ‘Fete de la Musique’ and yet again it was a Soundcraft® Si3 digital mixing console at front of house that delivered an action-packed ‘World Music Day’ with the ‘Alliance Francaise de Delhi’. The festival was presented through the 64-input Si3 and other Harman products including a dbx 4800 system controller, JBL VRX932LA, SRX728S and SRX712M loudspeakers, and Crown I-Tech IT4000 amplifiers. The event featured three groups, namely: Indian grunge band October; modern alternative band Poured on Ice; and Tarang, a musical ensemble conceived by leading Indian artists fusing Indian and Western classical music through instruments including the veena, sitar, mridangam, tabla, manjira and flute, drums, octopad, saxophone, piano and bass guitar. Yogesh Dhawan, of Dhawan Electricals Pvt. Ltd piloted the Si3 at front of house: “I used about 32 channels on the board with all its four Lexicons and a lot of compressors. On a recent trip to the Soundcraft Studer factory in Potters Bar, Deep Purple FOH man Gert Sanner, talked about the recent Deep Purple tours of Japan and Russia and his experience with the Soundcraft Vi6. That region is a strong heartland for the UK rockers, as the tour took in 12 shows in venues of 5,000 and above including Tokyo, Hiroshima, Nagasaki, Osaka and Nagoya – some of the same venues that played host to the recording of the band’s most famous album, Made in Japan, some 37 years earlier! “The whole thing was a great success,” says Gert. “Purple has a huge following out there so the band likes to revisit their fans as often as is practical for everyone. The Soundcraft Vi6 and Vi4 have found favour with many high profile global tours this year as well as prestigious theatre and performance venue installations including Benaroya Hall in Seattle, The Kennedy Center in Washington, D.C., and The Turin Royal Theatre (a full list is available on www.soundcraft.com. You can meet Gert and learn more about his travels and the Vi Series at Soundcraft, date and details yet to be announced. To keep the dialogue intimate for this production of the stage classic, all the components of the sound system had to be invisible, and the Vi4’s ultra-quiet operation assured success. NEW YORK, New York – The recent revival of the stage classic ‘Waiting For Godot’ was as brief as the play itself is famously cryptic, running only from April 3 through July 12. But in that time, the production won widespread critical acclaim and garnered Tony Award®, Drama Desk Award® and Outer Critics Circle Award® nominations for Best Revival of a Play for the as well as Tony Award nominations for Best Featured Actor, Best Costume Design, and for three of four of its cast members: two-time Tony Award winner Nathan Lane, Tony Award winner Bill Irwin and Tony Award winner John Glover, who joined Golden Globe winner John Goodman to round out the sparse but powerful production. The play is intensely intimate and dialogue-driven, making the quality of the audio critical to its success. That quality was assured by the 48-input Soundcraft Vi4™ digital live mixing console that was installed in the Roundabout Theatre Company’s Studio 54 venue. The latest addition to Soundcraft’s highly successful Vi Series of digital live sound consoles, the Vi4’s compact frame offers tremendous processing power, amazing sound quality and, so crucially for ‘Waiting For Godot,’ incredibly quiet operation. Tony Award-winning Director Anthony Page wanted to create a profoundly intimate ambience that would deeply engage the audience in the 1,500-seat theater. Thus, Sound Designer Dan Moses Schreier encouraged Page to use lavalier microphones hidden on the four actors, as well as strategically placed foot microphones. “There was a lot of emphasis placed on the sound being as transparent as possible so that no one in the audience could tell the show was being amplified at all, so I needed a system that would keep a low profile--visually and aurally,” Schreier says. With the decision to use a PA system, the choice of mixing console became critical – it would be the hub of an entire sound system that would need to be reliable, flexible and most importantly, invisible to the audience’s ear. The Soundcraft Vi4 proved itself more than up to the challenge. In just under 1.5m/5 feet of length, the Soundcraft Vi4 digital live sound console offers access to 72 inputs on 24 faders, with a total of 35 output busses available for use as masters, groups, auxes or matrices. And the features of the larger Soundcraft Vi6, such as the highly acclaimed Vistonics™ II touch-screen user interface, Soundcraft FaderGlow™ fader function display and the unequalled audio quality, are all present on the Vi4. The event commemorated the 70th Anniversary of the Evangelical Reformed Church of La Lima. LA LIMA, Honduras – In an event that highlights the growing adoption of Soundcraft digital consoles throughout Latin America, Mega Audio recently supplied the audio reinforcement system, including a Soundcraft Si3 digital console, for a concert commemorating the 70th anniversary of the Evangelical Reformed Church of La Lima in Honduras. The two-night, one-day Evangelistic Crusade Concert included the participation of Ministers of National Praise, Worship Ministry Children’s Church and Evangelical Reformed Church of La Lima, Lourdes Ministries, Carlos Martinez and Ministry Juda, and Roca Fuerte Shekina. Based in San Pedro Sula, Honduras, Mega Audio specializes in the rental of professional audio, lighting and large video systems for projects including conventions, conferences, seminars, concerts and evangelistic religious events throughout Honduras. For this event, Mega Audio needed a system with sufficient flexibility to facilitate seamless and quick transition between the numerous performers. 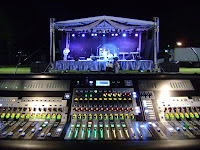 To that end, the company deployed the Soundcraft Si3 digital live sound console at the front of house position. “We chose the Si3 for its exceptional sound quality and for its speed and ease of setup,” says Luis Roberto Lopez Sanchez of Mega Audio. Boasting intuitive operation and high input and bus counts, the Soundcraft Si3 digital console is designed for live use on both touring sound systems and in fixed installations. Above each fader on the Si3 is a rotary encoder, the function of which changes according to the mode selected. This ‘bank’ of encoders, known as the VCS or Virtual Channel Strip, can be set to control every function of a channel (known as Channel mode), so mic gain, EQ, dynamics, auxes, panning are all controlled in the same manner as an analog channel strip. Moses Lake School District in Moses Lake, Washington has chosen Hitachi Software StarBoards for its student curriculum for all grade levels and subject areas, providing a district-wide technology upgrade that truly enhances the overall educational experience. Purchased through Troxell Communications, the school has allocated over 100 Hitachi FXDUO-77 model StarBoards along with the award-winning Hitachi CP-A100 3LCD ultra-short-throw projector as part of the Hitachi CPA100+FXDUO bundle. RTV Slovenia (Radio-Television Slovenia), the country’s public, non-profit radio and television broadcaster, has commissioned two radio OB trucks for musical recordings, equipped with Studer Vista 5 digital consoles. Supplied by Studer’s local distributors, AVC Group, the turnkey installation was overseen by the company’s subsidiary system integration operation, TSE. Czech sound engineers who regularly migrate between the public TV network and commercial stations become accustomed to the uniformity of Studer workstations, such as the Vista 7 and Vista 8 wherever they go. In fact, the Studer pedigree is so popular in the Czech Republic that when the private station TV Prima (the country’s third largest) was ready to decommission its analogue desk, which was regularly breaking down, the choice was self-evident. Studer would not only provide a reliable digital upgrade with long term expansion possibilities, but the station knew its engineers would require no training. Although it reviewed other options, the station owner Prima TV Holding Company (a 50/50 partnership between Czech investment group GES Holding and Scandinavian Modern Times Group) readily backed the Studer Vista 5 proposal. The new Vista 5 is located in the main control room, which connects to two studios, with the main news, all sport events and even popular game shows mixed to air using the Vista 5. TV Prima also owns the exclusive rights for to the British Premier League, which requires the most complex system configuration, with all sends and returns compressed in two layers on the desk, and four live studio mics for inter-match studio debates. Two telephone hybrids, with remote control, allow live entries into the programme — for example, the hybrid is also used during the Premier League football, when experts are contacted to add their remarks over the phone. Studer’s 32-fader Vista 5 consists of 20 channel strips, optimised for input channel operation, and 12 additional versatile strips for operating output and input channels. By using the standard Vistonics™ screen, up to 52 outputs are under immediate control. In addition, the Vista 5 offers full surround capabilities, with formats including 2CH stereo, LCR, LCRS and 5.1. The internal 5.1-to-stereo downmix function allows for simultaneous live productions in both formats. The Vista 5 also includes Studer’s famous 'Virtual Surround Panning' (VSPTM). Prima TV had originally chosen the Vista 5 on the basis of its reliability (which would safeguard long-term investment), easy access to frequently used functions and excellent sound quality. With the planned move to HD, it will be a natural process to implement multi-channel sound (with expansion such as SDI embedder / de-embedder already in the planning). The iTunes Festival relocated to The Roundhouse in North London this year, with over 60 artists playing live at this free event, which runs throughout July. With bands ranging from Oasis, Kasabian, Franz Ferdinand and Snow Patrol at the commercial end to acoustic performers like Newton Faulkner, quirky performance artists with wide dynamic ranges (like Bat for Lashes’ Natasha Khan), leavened with some good old fashioned hard house and R&B it was important that the event’s experienced sound engineers, Dave Roden at FOH (here deployed as system tech) and Will King down at the stage had digital mixing environments on which incoming engineers could hit the ground running. Last year, when the event was held at KOKO, iTunes production manager Stuart Turvill took advantage of a pair of Soundcraft Vi6’s, with the intuitive Studer Vistonics II™ interface, and it proved so popular he saw no reason to break from that tradition. A 64-input Vi6 (with AES-EBU cards) was one of two digital surfaces offered at front-of-house, enabling incoming productions to simply plug in their show files, while down at the stage the compact surface — always a bonus within the confines of Monitor City — was configured 64-in/35-out. Stuart Turvill was indeed fortunate to have his near neighbour from the Welsh valleys, Dave Roden working alongside — and despite their long relationship, the Stereophonics’ trusted sound man for the past 14 years was working the event for the first time. "Stuart has asked me on previous occasions but I have always been touring," says Roden. "But the band has only done one show this summer and is currently mixing an album in the studio, so I said I would love to do it." Although being a relative newcomer to the Vi6, Dave Roden was able to turn teacher after the briefest of inductions on the board. "The only time I had seen it previously was when the Stereophonics played the iTunes Festival at the ICA two years ago," he admits. "I had never even touched one of these desks before, but within a couple of days I could show people how to use it!" "The Vi6 is great, particularly for engineers who don’t have their own session file because it’s an easy desk to walk up to. I set up a basic template and engineers simply overlay their mix on that." For those who have only previously worked in the analogue domain its straightforwardness is particularly reassuring. "Not only that, but it produces a nice sound and has great preamps. We have certainly had a lot of compliments." Dave Roden said they opted for the 64-channel board knowing they would have a choice of two boards for main act and support. "This gives us 32 channels on Layer A, and another 32 on Layer B." "I will simply label the channel and provide a couple of tap delays, reverbs and vocal thickener. However I leave the EQ and dynamics flat because if you dial in too much in advance it can becomes confusing — simple is better." However, he did say that the channel capacity was stretched when Snow Patrol appeared, supported by Silversun Pickups and Animal Kingdom. "That was a big channel requirement," he said. "But Snow Patrol only required a left and right feed from their control, so the Vi6 managed to cope admirably with the two support acts." Will King agreed with his colleague’s assessment of the desk, though he admits he had to mix the first shows himself. "At the beginning I didn’t have a visiting engineer for four days — and in a way that was good because it kept me busy. It’s so easy to show sound engineers how to use the Vi6 — and I become pretty much redundant once the soundcheck starts." For King the exercise is a repeat of 12 months ago, when he supervised all 31 days at KOKO on the resident Vi6 — briefly breaking away to work with one of his long-term artists, Stereo MC’s (the others being Darren Hayes and ex-Morcheeba singer Skye). "I set up a basic template. I can have all the wedges and IEM’s patched onto the aux outputs at one time, and sound engineers come in and choose what they want. Everyone likes a desk that’s easy to operate and I try and make sure they don’t have to be flicking from page to page." All the in-ears are on stereo pairs and Will King admits he likes to have his side fills on a dedicated stereo aux "which I realise is unconventional," he says. In summary he states, "The desk has been well designed for the monitor engineer and it’s easy to flip the faders. For engineers doing a one-off show such as this it’s absolutely perfect." For Stuart Turvill the iTunes Festival production has notched up a gear — to a larger venue in which he has installed full choice of recording options — and LED 6mm side screens for the first time. "You don’t get a lot of resistance from engineers when they see the Vi6," he concludes, adding that he has good reason to thank Soundcraft’s sister brand, BSS Audio, for the 144 channels of [MSR-604 II] splitters that are being used. "I can’t speak highly enough about the support we’ve had from Sound Technology (UK distributor for the Harman Pro brands)," he says. In a high-profile international application of JBL touring systems this summer, rental sound company Touring Services supplied an expansive audio system for the Global Gathering Freedom Festival at the Borovaya Airfield in Minsk, the capital city of Belarus in northern Europe. The system included products from JBL’s VERTEC® DP Series and HLA Series loudspeaker lines. 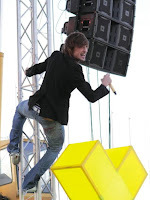 Major internationally known DJs were featured, including Axwell, Steve Angello, Dubfire, Sebastien Leger, D. Ramirez, Menno De Jong, Micky Slim, Paul Thomas, and Eston. World-renowned performance artist D.J. Tiesto was the headline act on the festival. Touring Services, a division of ART Studio Pro, was the rental sound company responsible for audio production at the event, with Vladimir Klimenko in charge as the chief system engineer. Due to the airfield location of the event, a very large crowd could be accommodated. Event organizers had originally planned for 15,000 people but were reportedly surprised when total pre-event ticket sales reached 36,000. Final onsite attendance was estimated at 50,000 persons. This year’s event included two main stages and a third, separate foam dance floor. Assembly of the stages and other support fixtures started on the afternoon of June 24 and by the morning of June 27 the site construction was fully completed. Sound checks were scheduled on event day, June 27, from 10 AM to 2 PM. The gates opened at 6 PM and non-stop music lasted until the early morning hours. The Global Stage was served by a JBL HLA system, with 24 4895 full-range elements and 12 4897A bass modules driven with BSS 366 OmniDrive signal processing and Crown MA-5000 series amplifiers. In a move that immediately extends its sound reinforcement capabilities, Florida-based systems integration firm Multi Image Group has purchased 110 Crown I-Tech HD amplifiers. MIG, which specializes in corporate A/V projects for clients such as CitiGroup, Deutsche Bank, and Proctor and Gamble, upgraded its entire amplifier inventory from the original I-Tech amplifiers. “MIG was not using Crown amplifiers when I joined the company. I didn’t agree with this because I had been using Crown since I started in the professional sound industry back in 1981 and they are bulletproof,” stated Andy Kakas, audio department manager for technical services at Multi Image Group. MIG purchased its first Crown amplifiers in 2002 with Macro-Tech and soon purchased I-Tech series amps as well. “We started by building a few JBL VerTec line array systems with the Macro-Tech amps and about six months later we got the I-Techs. The sonic quality and built-in DSP of the I-Techs were major advantages when comparing Crown to other amplifiers,” added Kakas. After purchasing the new I-Tech HD amps, Kakas immediately noticed the improvements. “The most important aspect of these new amps is the sonic detail. It has a transparent top end, which has an open and natural sound. It maintains the Crown dampening that gives you that punch in your chest. Also, the Cobranet™ integration is quite useful since we have had a need for multiple channels of AES from front of house to the stage and the amp racks,” said Kakas. I-Tech HD features a new user-inspired DSP engine co-developed with BSS called OMNIDRIVEHD. The new processing engine features Linear Phase FIR filters that offer unrivaled crossover performance for sonically pure tunings. The OMNIDRIVEHD processing engine also features an innovative new suite of limiters called LevelMAX™. Harman HiQnet™ System Architect ™ mirrors the typical browser navigation interface to provide tour sound and contracting professionals with a familiar interface to access a host of power configuration and control functions. Seasoned sound engineer Walter Jaquiss recently joined forces with ADLIB Audio and Lighting for the latest John Barrowman tour and two Soundcraft Vi6™digital consoles were used for the production. "I think a lot of engineers started on Soundcraft, whether on a 400 or 800 Series. That's certainly what I learnt on, and it was a sensible platform." "Today, a lot of colleagues are using 'real' desks because the learning curve is easier, yet the Vi6 invites the move from analog to digital. They have provided a control surface that I think most experienced analog engineers can just walk up to. The desk really spoils you, as one of the big advantages of the Vi6 is that everything you need is right there in front of you on the Vistonics screens...it's as if everyone else has missed a trick." The Barrowman shows could not have been mixed on a surface offering less than 96 channels, he stated, adding how easy the Vi6 is for file-building. "Using the offline editor is fantastic as it's identical to the desk itself." "There were seven bands a day at each venue and we were just able to email the show files overnight between myself and Steve Pattison in Manchester. The show mixes came up exactly as they had been created the night before - we had the files loaded into the desks before the band's engineers walked in the next day." "In fact, I was able to program all the bands' files in the back of the car on the way down to the Brixton É and I could do the same with John Barrowman." Aside from BSS's trusty multiband DPR-901 dynamic equalizer, he used all the onboard desk effects. "The advantages of keeping everything within the box outweighs that of having a rack of outboards. I used all the Lexicon onboard FX engines and add to that the gates, processors and graphics on every output and it adds up to an incredible amount of facilities on the Vi6." The monitor setup was mainly all in-ears - Barrowman, band, crew and guests - with James Neale mixing on another Vi6. ADLIB's Hassane Es Siahi and Kenny Perrin completed the audio team. But the final message to digiphobe engineers comes from Walter Jaquiss. "Anyone who thinks they can't get to where they want to on a digital mixer as quickly as an analog set-up might find the Vi6 a lot easier to use than they think." For two days every year, Ravensbourne College in Kent, is transformed into one of the country’s most exciting and innovative broadcasters, as students go on-air for their annual broadcasting event, ‘Rave On Air’. The college has some notable ex students including Stella McCartney, Bruce Oldfield and Darren Woolfson, now Group Director of Technology at Pinewood Studios. Rave On Air is an entirely student-led event with over 5 hours of live programming broadcast over the internet and local digital terrestrial television channels (800 and 801). Attended by broadcasting and creative industry professionals including BBC, Endemol and Channel 4, this graduate showcase gives Ravensbourne students the chance to gain experience of creating and delivering a range of content for broadcasting in real-time. It is also a major opportunity to showcase Ravensbourne talent and help students network and build industry contacts that prepare them for a broadcasting career after they graduate. The Royal Television Society visited Rave On Air to host one of their regular public events – a conference on 360 degree broadcasting with speakers John Denton (BBC Future Media and Technology, Managing Editor TV Platforms) and Matt Millington (BBC Sport, Video Portals Editor). The Vista 5 SR was used on the live broadcast from the college’s amphitheater. Level 3 BA Sound Design student Samuel Burkinshaw commented on the desk’s Vistonics user interface: "The Studer desk was really easy to get to grips with, and it was great to have Andrew Hills from Studer come down and show us how it worked. It was really quick to set up, easy to understand, and the interface was a joy to use." The Vista 5 and 5 SR has been quickly accepted by some of the world’s largest hire and tour companies, such as Clair Brothers in the US, and has been used recently on major international tours, including Celine Dion, Katie Melua, Rascal Flatts, Billy Joel, Mylène Farmer and Keith Urban as well as prestigious installations such as The Palace Theatre on New York’s Broadway (West Side Story) and The Kennedy Center in Washington DC. Rave On Air is broadcast over two channels simultaneously, mixing live magazine shows, fashion catwalks and interview spots with pre-recorded dramas, documentaries, animations and quiz shows, all written, produced, directed and masterminded by broadcast students from all levels. The Vista 5 SR allows tudents from all disciplines of the college experiment with new technologies and new ways of interacting with their audience. Freddie Gaffney, Deputy Head of the Faculty of Communication Media said, "Rave On Air is a unique opportunity and a great chance for our students to stand out from thousands of other graduates across the country. The students this year have met the challenge head on and they’ve really excelled themselves and can justifiably call themselves young professionals. As always, I am very proud to be associated with them." Next year’s event marks the 40th year of Rave On Air, and the last one at the college’s current campus before it relocates to Greenwich Peninsula in 2010. The new Ravensbourne building will house two HD television studios, digital media studios and production suites, virtual environments and a postgraduate centre for enterprise and innovation. Its proximity to London will encourage even greater opportunities for Ravensbourne students to collaborate and network within the broadcast media industry.